This is the absolutely sweetest smelling violet I have ever smelled. Pure white flowers yield a sweet perfume to the air. Lovely. Dissected foliage is fernlike and gives nice texture to the shade garden. Can be brought indoors as a plant or cut flower to enjoy the fragrance. 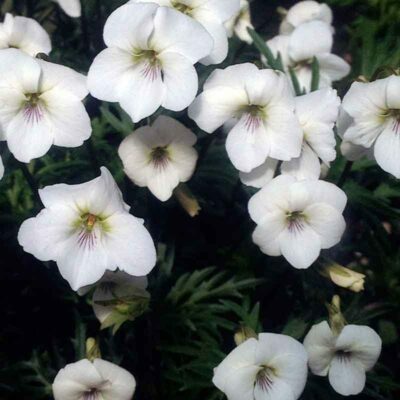 Grow in full to part shade in moist, but well-drained soil. Height and spread 6-8″. Self-seeds politely. Zones 4-8.